One of Citizen’s gameplay themes is the limitation of what weapons you can use. As a citizen of a dystopian, Robot-controlled city, you couldn’t freely carry dangerous goods and not expect to be accosted by Robot patrollers. It was in the INV system that I first wanted to express that game concept. 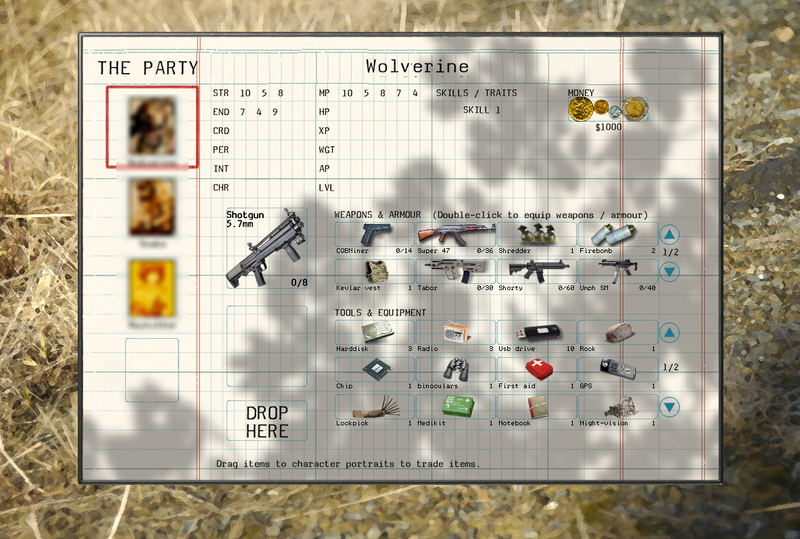 The INV system was originally conceived so that the Player can carry only a few weapons. So I delineated certain types of items can only be placed in certain ‘slots’. I also limited the number of slots for a particular category. However, in time, I came to think that the limitation was a bit too extreme. It was complicated from the point of view of mechanism, but it also had logical game problems. Nearly 3 years ago I was working on an RnD game project (dubbed Henry) which was supposed to feature multiple characters. The system allowed the viewing of different inventories within the same interface, and allowed trading between characters through a drag-and-drop mechanism. It featured multiple pages and a categorisation of items; weapons and armour were automatically put into the upper slots, and other adventure items were put underneath. It was Henry‘s Inventory system that gave me my first experience in the in the difficulty in doing inventories, from the organisation of items, to the behaviours of drag-and-drop and how the logic of how things are arranged and displayed. Also from Henry I took the idea of categorisation, which is the exclusive placement of items of a certain type into a section of slots in the interface. But categorisation, I later decided, was not necessary if I was just simply gunning for weapon limitations. There were other ways of discouraging the Player from carrying too many, from the increased likelihood of getting checked by Robots, or simply the inability to use them effectively once the shooting started. Because there were hundreds of ways to skin the limitation cat, I eased my rigid rules in the INV system. However, unlike Henry I had two other Inventory-related concepts that I had to address to introduced their own complexity: Readyslot, and Trade. 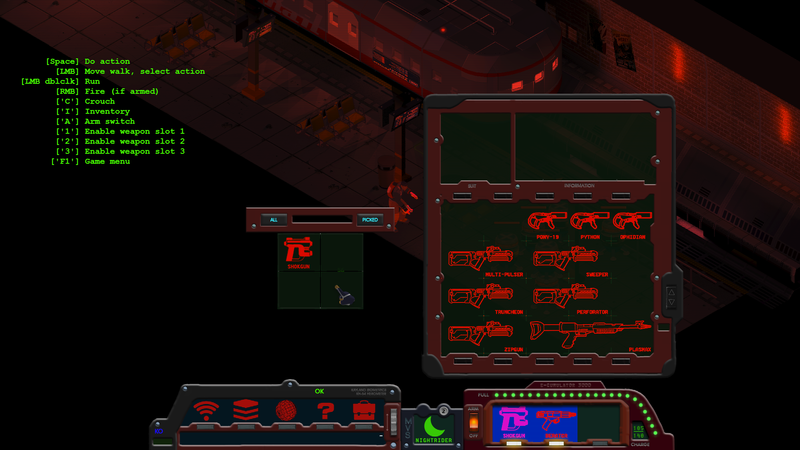 The Citizen INV (right), Trade( left) and Readyslot (bottom-right) interfaces. Without going into too much details about the the Readyslot’s mechanics, it is simply the place where weapons that will be used immediately for combat are put. Switching weapons that are already in the Readyslot are done immediately. However, there’s a time-delay when you try equipping weapons from the INV, which may be akin to taking something from your backpack. This is how the game discourages the Player from swapping weapons from the INV which may potentially contain a lot of different weapons in the game. There are other characteristics: there are only 3 slots in the Readyslot area, and that is significant. Pistols are 1-slot weapons, subguns (i.e. SMG) are 2-slot weapons, and rifles are 3-slot weapons. You can mix and match any weapon configuration that the number of slots numerically allows. But there are special considerations for pistols, too: you can dual-wield pistols. If you choose to equip a subgun, you can carry another pistol as ‘backup’. If you choose a rifle, the most powerful weapons in the game, you are limited to that weapon only, and if you try to change weapons from the backpack, there’s a time-delay to get it. The technical challenged associated with the Readyslot is how that in itself is an extension of the INV system even though it may not look like it visually. The Readyslot is a categorisation, so only weapons can be placed in there. The Trade system is essentially the INV system, but using a different source for the contents of the INV. For example, NPCs have their own INV database, and even scene elements, like a rubbish bin that can potentially hold items, have their own INV system. The Trade system is a little different from INV in that there is a variable slot designation that is dictated by some database (in this case it’s specified in Tiled). For example, a rubbish bin will have 2×2 Trade INV (a.k.a. TINV). A dead robot will have 1×1. Some may have 3×1, or 4×2, etc. And thus there were many considerations about how the system will respond if there was an attempt to populate the TINV with more slots that it could hold, or items that wouldn’t fit the dimension of the slots. For example, a 3-slot rifle cannot fit in a 2×2 TINV. In games like Diablo, items occupy ‘slots’ in the inventory. But Diablo’s system is very elaborate, as items have both width and height. For Citizen, I decided only to consider how many slots a certain item will occupy. For the most part, only rifles and subguns occupy more than one slot. This greatly simplified the system. The reason why this is a big deal is because one of the challenges of making an INV is the correct display of items in their proper slots. When dragging a rifle (3-slots) at the right-most slot of the INV, you expect the system to compensate for the size; it must not place it the right-most slot, but 3-slots to the left in order to the rifle to fit the intended placement location. Also, you have to consider if there are items currently in place in those slots. Will you allow items to be displaced? If so, how do you logically re-position them that makes intuitive sense? If dragging a rifle from the INV to the Readyslot that is already full of weapons, will you make a swap? Or disallow it? The multi-page function isn’t yet implemented, but I have to make sure to what extent I implement it. How many items will I end up implementing in the game’s narrative and combat? How many pages will it fill? Should I have unlimited pages? Or is one page a good simply limit? Lots of questions. But it’s all part of the fun, right?